PharmaUp program is not just a Pharmacies and Drug Stores Program, but it is the only program that makes a dream come true, here only all the puzzle pieced together: ease, Unique and special design, speed and multi features in a one single program. Attractive and unique designs using windows comfortable to eye with easiness of reading data in clear letters and large keys and data input places which makes it suitable to interactive touch screen properties instead of distracting colors and small unrecognized letters, also it is a Multilanguage program. 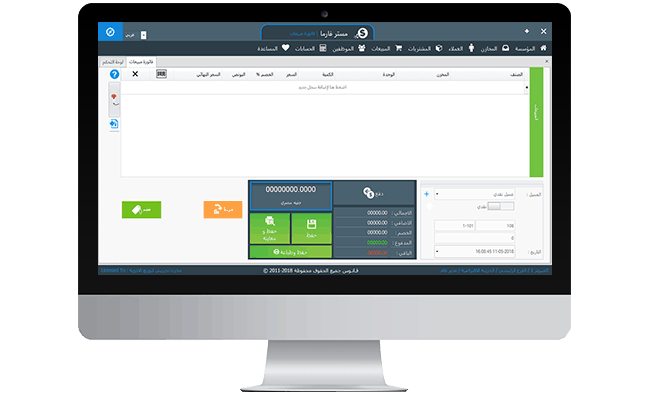 System is creatively programmed with the latest technology enables it to be a market challenger with very high and very fast performance with variety of features, it is for your sake and will take your business to the next levels, add thousands of records in seconds. PharmaUp system for pharmacies and drug stores is very easy to deal with, you and your employees are not in need of a high computer experience, it also supports interactive touch screen properties which facilitates more rapid and complicated operations. Have you ever imagined that you have a system for your pharmacy or your store contains all the features you may need, PharmaUp is actually an absolute complete system. So, do not bother yourself searching. PharmaUp program allows you creating and remote managing your multiple branches organization. The system also supports networking and Internet access, with connections to branches and repositories. Through the treasury Module you can view all the balances, transfer the balances from one repository to another with detailed reports of repository and expenses transfer and you can also add more than a single repository and also determine the accountant responsible for them. You can add more than one unit of the product (pieces , Packages …) each unit at a different price and different discount for buying and selling and adding it easily to invoices. You can create many stores with great flexibility, sharing more than one branch in one store, registering product with more than one unit, possibility of switching between stores and changing the status of products as expendable or missing, with accurate inventory and appointment of storekeeper or employees. The focus on procurement and suppliers in two main directions: calculating profits accurately, buying from suppliers at the best prices and discounts. So the neglect of the procurement module can be a cause of loss and failure for any institution as can be a reason for success. Contains the History of purchase price of the product with the names of Vendors, making it easy to determine the most suitable supplier to deal with. Enter products to more than one store with a single purchase invoice. 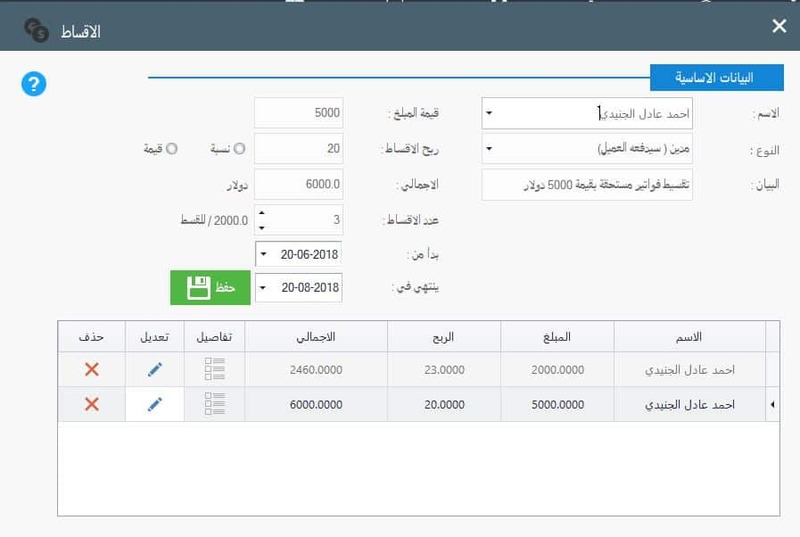 Register customers and suppliers and assign balances for the first period with the credit limit for each client and connect the customer with a specific sales representative with a large number of detailed and comprehensive reports of accounts of customers and suppliers and their balances and records. The program also allows you to arrange payments into intervals of time and financial interests that can be previously fixed. Personnel Affairs System enables you to record detailed employee data, vacations, salaries and advances, and specify the attendance and departure time for each employee, including comprehensive and detailed reports for each employee. 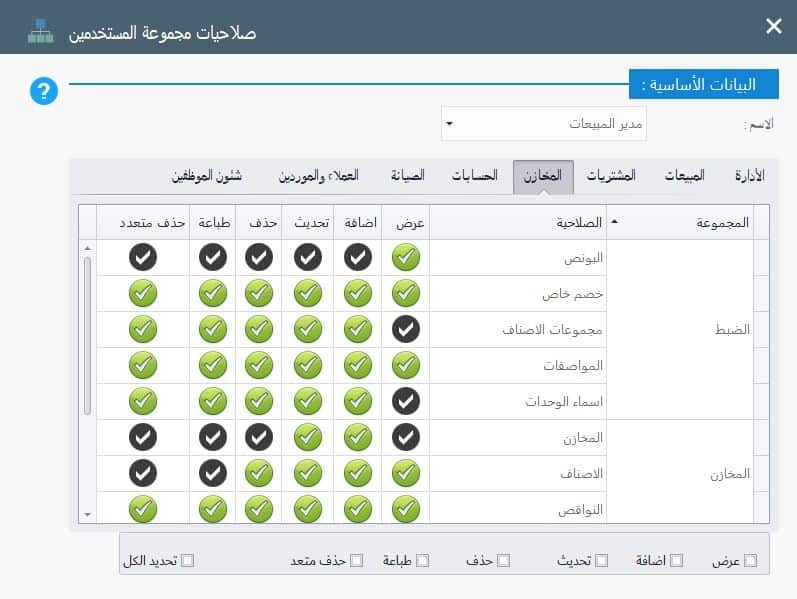 You can also record the guardianship, training courses and all related to employee activity within the organization. You can also register an infinite number of users with a password for each user and specify the privileges of each user at the level of screens as well as the properties within each screen whether addition or deleting or modification. PharmaUp program for pharmacies and drug stores management enables you to assign multiple jobs, departments and enterprise sections. It includes many discounts such as: (discount product, discount bonus, direct debit on the invoice, discount payment terms. The control room of PharmaUp program allows you to monitor all processes that occur with a clear record of user data and the date of occurrence. One of the most important features in Pharmacies and Pharmaceutical stores Accounts program is that you can print and design your barcode or the product international / local code. You can easily print a barcode for a product or invoice. PharmaUp System support Network connection and work remotely using Internet. The system is characterized by a large number of comprehensive and detailed reports for the whole system, for stores, products movements and balances , sales and purchases, customers and suppliers, accounts and detailed entries. You can also create daily, monthly or yearly sales and purchasing reports in seconds. Showing the products that cause loss or product shortage, products profits, dates of validity and bonuses to the products. Multiple format and size of sales invoices to fit your normal printer or thermal printer. You can print reports or export them to (Excel.. PDf.. HTML) file, Image, and many other formats, and you can send it directly to the manager using e-mail. Accounts are the focal point of any system. PharmaUp Unlike most systems, it deals with accounts, profits, gains and losses with the issuance of bills of receivable and payment voucher, bonds of expenses and revenues, assets and capital registration. A huge accounting tree and a comprehensive ledger, reports of daily entries and all day-to-day activities. معارض الاثاث وقطع غيار السيارات، محلات الادوات المنزلية والاكسسوارات ، المخازن بمختلف انواعها ، المكتبات ، محلات ملابس ، محلات احذية وجلود ، محلات دهانات ، شركات الفلاتر ، معارض المفروشات ، مواد البناء ، شركات الادوات الصحية ، شركات الاطارات والبطاريات ، محلات نظارات ، مكتبة الاكسسوارات والهداية ، التوكيلات التجارية ،الاثاث ومستلزمات المكاتب. Our story began when we decided to change the reality, and make it a better reality. We started with what we have mastered, programming and development. We took it upon ourselves to provide what is the best and the most wonderful in the world of programming and design and to get out of the old tradition fund to the space of progress and knowledge by providing attractive systems with high technology and unprecedented capabilities. We believe there is always more and better. So go with us and enjoy your life.